Since 1985 we’ve been working hard to help you save money. Whether you’re insuring, investing or enjoying your retirement we’re here to help. Here we are opening our doors for the first time over 30 years ago. We’re still in High Wycombe and some of the faces you see here are still at Moneyworld. A lot’s changed since then, including the hair-cuts but what hasn’t changed is our commitment to you. Without our customers we wouldn’t be celebrating 30 years of service, so if you’re already our customer or you’re thinking of using our services, thank you. So what’s changed since 1985? 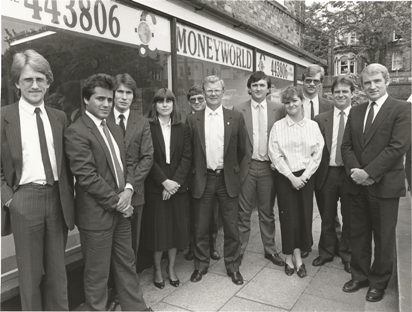 Moneyworld was started as a financial adviser 30 years ago. In the late 90’s we wanted to give people the option of arranging insurance or investing without taking financial advice. This led to the creation of Moneyworld.com in 1999 and here we are 17 years later. We don’t give financial advice or recommendations here. Instead we focus on giving you the information you need to make your own decisions. Then whether you’re buying life insurance or investing in a bond we’ll offer all the products at the best possible value. Our aim has always been to offer financial products in a clear and transparent manner. No hidden charges or commissions, no jargon and definitely no pushy sales calls! We’re very proud that several well known websites have recommended us. Take a look at MoneySavingExpert.com, This is Money, The Express and The Guardian to see what they think of us. You can buy your life insurance online, research funds or invest in a structured product but if you want to speak to a real person head over to our contact us page and get in touch. You won’t find any call centres here. Most of the time you’ll be able to deal with the same person time and again. “I found the website really easy to use. This is actually the second time I used your site to buy insurance and the prices are great. Thanks for setting up such a useful website – much better than the usual comparison sites”. Just as a final comment, your website is very user friendly and previous business with you has been conducted in a very efficient manner”. “Thanks for your speedy acknowledgement. So glad I seem to have found a company that is reasonably priced and provides a good service”. “Thank you. I chose to invest through Moneyworld as your commission is the lowest I can find. The service is very good as well”. “Thanks for your help. I have found your website very easy to use, informative and above all very reasonable in terms of cost”. “For a fee of only £25 I’ve been very impressed. Your customer service has been very friendly, useful and fast to respond”. “The broker I dealt with was very efficient and friendly in his responses to my enquiries as to the progress of the applications and always promptly acted on everything I asked of him”.